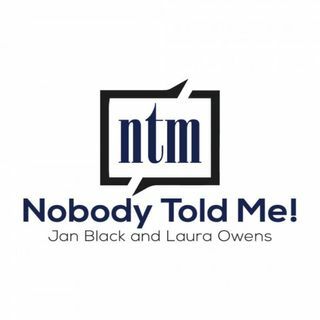 When mother-daughter duo Jan Black and Laura Owens first conceptualized their two-generational talk show, nobody told them they’d snag the title of #1 self-help podcast for months on end! But that’s exactly what they’ve done, delving into topics as far-flung as network building, the importance of failure, finding hope after being ... Más informaciones kidnapped, and how the principles of brain surgery can help us work through everyday problems. Featuring interviews with extraordinary individuals, Nobody Told Me! shines light on the shared human experiences that bring us together, and the challenges that serve as catalysts for our greatest growth. Nobody Told Me! combines Jan’s impressive broadcast journalism background with Laura’s unique, millennial perspective. Driven by a genuine desire to educate and empower, their pioneering platform gives insight into the strategies and secrets of people in all walks of life. Equal parts information and inspiration, Nobody Told Me! brings a personal touch to the interview process. Together, Jan and Laura are asking the questions that help their listeners get through life’s toughest times.